The Bilberry Hill Centre is head office to the Birmingham Federation of Clubs for Young People, and is also a residential centre. It is situated in delightful surroundings on the edge of the 500 acre Lickey Hills Country Park. The Lickey Hills is covered by a maze of footpaths, bridleways and an orienteering course and offers an abundance of flora and fauna. The surrounding area provides endless opportunities for interesting and exciting outdoor activities. The Centre is on the outskirts of Birmingham, convenient for the motorway networks and also within easy reach of Birmingham city centre by public transport. Various types of accommodation are available to suit all groups, ranging from single rooms to dormitories and a bunk-house. The minimum number for a group booking is 15 and it sleeps a maximum of 64. 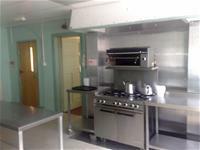 The centre also has a Sports Hall area, several large meeting rooms and a fully equipped kitchen. We offer a fully catered service, but we also take self-catering bookings. Various bathrooms throughout the centre; all are equipped with showers. The main house has a range of rooms, varying from single rooms to large rooms accommodating 6. The Hillside extension has 17 single rooms & 2 twin rooms, as well as a common room. The Bunkhouse is made up of 2 dormitories; one sleeping 8 and the other sleeping 10. In addition there are also two twin staff rooms, making a group total of 22. Please note, we don't accept bookings from Stag or Hen parties. Cadbury World: (approx. 6 miles/12 minutes away) Birmingham is the home of chocolate - why not visit the masters and see how the worlds greatest chocolate is made (you'll even get to taste some!) A fun, educational multimedia attraction dedicated to the story of Cadbury and chocolate. Cadbury World has now launched two fantastic new attractions; Essence and Purple Planet. The Bull Ring: The £500m Bullring development has transformed Birmingham into one of Europe’s leading shopping destinations. Fronted by the iconic Selfridges, the Bullring has become not only a shopping centre, but an international city attraction. 26 football pitches worth of shops, boutiques and restaurants lie within it, which makes it not only the largest, but one of the most stylish retail developments in Europe. New Library of Birmingham: This £188m project opened to the public for the first time on September 3rd 2013 and is the biggest public library in the country. Stratford upon Avon: Stratford upon Avon is the birthplace of playwright William Shakespeare and home to the Royal Shakespeare Company. The Shakespeare Birthplace Trust is the guardian of five houses connected to the playwright’s life and family, including the house where he was born. A guided tour is certainly recommended, but it is equally pleasant to simply walk around and enjoy the town. The town is about an hour away by train or bus. Ironbridge: Awarded World Heritage status by UNESCO for the area's unique contribution to the birth of the Industrial Revolution in the 18th century, Ironbridge Gorge has a cluster of 10 museums and of course the famous Iron Bridge of 1779, the first bridge made of this material anywhere in the world.300 years ago this was the world's technological hotspot where Abraham Darby first perfected the use of coke to mass-produce iron. Entrepreneurs and Iron masters such as William Reynolds and John Wilkinson made good use of this wonder product. Wilkinson was even buried in an iron coffin!An hour’s journey by road from Birmingham brings you back to the origin of the Industrial Revolution.